This is the last post for a while as God and Politics takes a break for Christmas. All years are difficult, but reflecting back over 2013, there has been little cheer. The economy may be beginning to pick up, but we’re a long way off the feel-good factor yet. Even in my more affluent corner of the world. I’ve seen friends having to deal with unemployment, repossession, illness, death, divorce, addiction and various other difficulties. No matter how hard we try, life is rarely easy. And that’s just for those who live in a rich and stable country. Thousands of millions around the world face daily struggles that we will never comprehend unless we have experienced them ourselves. The situation in Syria is an extreme and constant reminder of how horrendous life can become when evil flourishes. Life is dirty, grubby, painful and full of sin. It was no different for Jesus at the time of his birth. His country was occupied by foreign oppressors. They had put a ruthless murderer on the throne who had no qualms about killing others to suit his political whims. The state religion had become controlling and corrupt. Jesus’ mother would have been shunned by her community for becoming pregnant outside of marriage. She had to travel 70 miles whilst heavily pregnant only to find nowhere remotely comfortable to stay and give birth . Not long after, his family was forced to become asylum seekers in an alien country in order to escape persecution. Yet amongst all of this suffering there is a moment of purity when Heaven and Earth collide in awe and wonder as Jesus enters into our world. The overwhelming joy of the angels leads the shepherds to the manger and in response they praise and glorify God as that uncontainable joy spills over. sorrow, inner emptiness and loneliness. 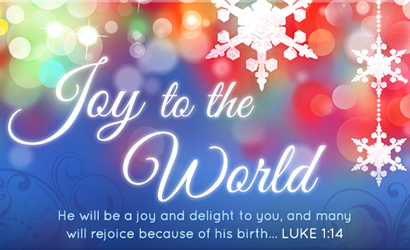 With Christ joy is constantly born anew. ‘The books of the Old Testament predicted that the joy of salvation would abound in messianic times. The prophet Isaiah exultantly salutes the awaited Messiah: “You have multiplied the nation, you have increased its joy” (9:3). He exhorts those who dwell on Zion to go forth to meet him with song: “Shout aloud and sing for joy!” (12:6). The prophet tells those who have already seen him from afar to bring the message to others: “Get you up to a high mountain, O herald of good tidings to Zion; lift up your voice with strength, O herald of good tidings to Jerusalem” (40:9). All creation shares in the joy of salvation: “Sing for joy, O heavens, and exult, O earth! Break forth, O mountains, into singing! For the Lord has comforted his people, and will have compassion on his suffering ones” (49:13). ‘Perhaps the most exciting invitation is that of the prophet Zephaniah, who presents God with his people in the midst of a celebration overflowing with the joy of salvation. I find it thrilling to reread this text: “The Lord, your God is in your midst, a warrior who gives you the victory; he will rejoice over you with gladness, he will renew you in his love; he will exult over you with loud singing, as on a day of festival” (3:17). ‘This is the joy which we experience daily, amid the little things of life, as a response to the loving invitation of God our Father: “My child, treat yourself well, according to your means… Do not deprive yourself of the day’s enjoyment” (Sir 14:11, 14). What tender paternal love echoes in these words! Even at Christmas, a time that should be full of happiness, so many find it stressful, full of worry and disappointment. That joy the shepherds experienced is well and truly lost. Without Jesus in our hearts and at its heart, the joy of Christmas cannot be fully appreciated. This is the greatest gift the Church can give to the world. It is too precious to be kept behind closed doors. Sermons and talks describing the salvation that comes through Christ’s birth, life, death and resurrection will be preached in churches up and down the country this Christmas, but this is not a message just for the faithful. We all need a saviour who can release us from failure, sin and a broken world. Jesus doesn’t remove us from the situations we find ourselves in. Instead he walks beside us, with us and in us. He brings light into our darkest places, inner peace in the midst of conflict, hope of a better future to come and an unspeakable joy that breaks through even in the most desperate situations. This is the true Joy of Christmas made available to each one of us if we are willing to receive and accept it. Gillan, thank you for all your work through this year. Many times your words have brought a prophetic word for our times and you have been a source of great support for the Lib Dem Christian Forum & our partners in the Conservative Christian Fellowship and Christians on the Left. Thank you for your blog, it’s one of my favourites. Just letting you know that God and Politics in the UK has been recognised for an award a over at 1catholicsalmon.